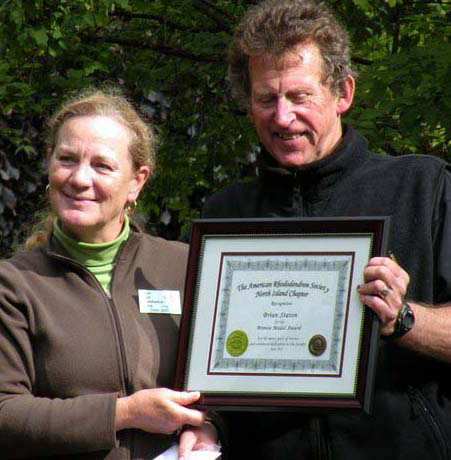 It was with great pleasure that President Diana Scott presented the American Rhododendron Society Bronze Medal to Brian Staton on June 16, 2012. The Bronze Medal is awarded for outstanding contributions to a Chapter and is the highest commendation awarded by a local Chapter in the Society. Brian has served on the Executive as Membership Chair since 2006, coordinated a number of bus tours for both the Executive and Members, planned several Garden Tour fundraisers, been a vendor at our Rhodo Sale, a regular at our work parties, and has been available whenever needed. We congratulate Brian on being awarded the ARS Bronze Medal by the North Island Rhododendron Society.